Q: what is loop? Ans: A statement or set of statements that is executed repeatedly is known as loop, or iteration. There are three types of loops available in C language. 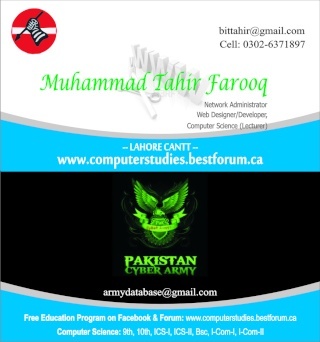 ü write a program that displays “Pakistan” for five times using while loop. (int n; n=1; while(n<=5); n++; and \n). ü write a program that inputs a number from the user and displays the factorial of that number using while loop. ü What is do-while loop? The do-while is an iterative control in c language. This loop execute one or more statements while the given condition is true. In this loop, the condition comes after the body of loop. The loop is important in a situation where a statement must be executed at least once. ü What is difference b/w while and do-while loops? While loop:Y in while loop, conditions comes before the body of the loop. Y if condition is false in the beginning, while loop is never executed. Y the semicolon is not used after the condition. do-while loop: Y in do-while loop, condition comes after the body of the loop. Y do-while is executed at least once even if conditions is false in the beginning. Y semicolon is used after the condition. Program: write a program that displays first ten odd numbers using do-while loop. » [Debate] Is the time loop of Sailor Moon a closed time loop?